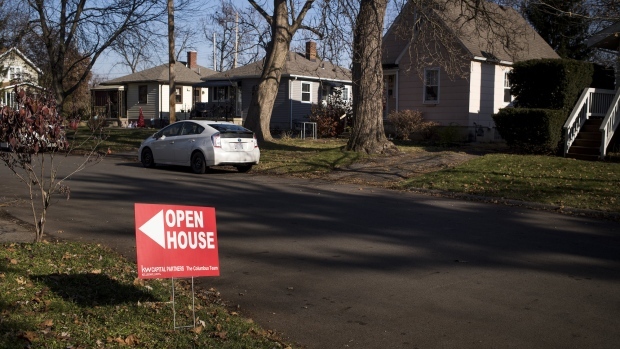 (Bloomberg) -- Sales of previously owned U.S. homes rose in October for the first time in seven months, suggesting demand is stabilizing at a lower level as available properties become less scarce. Contract closings increased from the prior month to an annual rate of 5.22 million, the National Association of Realtors said Wednesday. That compared with economists’ projections for sales of 5.2 million. The median sales price rose 3.8 percent from a year earlier, while the inventory of available homes expanded 2.8 percent, the third straight increase. Even with the monthly increase, the market remains relatively soft, as sales were down 5.1 percent from a year earlier, the biggest drop since 2014. Housing is being buffeted by the highest mortgage rates in eight years and rising property prices that continue to outpace wages. Residential investment accounts for about 3.9 percent of the economy. Two other housing reports this week gave a mixed picture of the sector: sentiment among homebuilders dropped the most since 2014 in November amid pessimism over both current and future demand, while government data showed housing starts rebounding slightly in October. Even with the slowdown in the housing market, Federal Reserve officials are still projected to raise interest rates in December for the fourth time this year and continue tightening in 2019, as consumer spending is seen remaining solid. NAR Chief Economist Lawrence Yun urged the Fed to consider pausing its interest-rate hikes amid other indicators such as soft inflation. “Demand is being choked off” by higher borrowing costs, Yun said at a briefing in Washington accompanying the report. Home purchases rose in three of four regions: the Northeast, South and West recorded increases, while sales declined in the Midwest. Sales declined from a year earlier in the largest price category, the $100,000 to $250,000 range, as well as below $100,000; they rose at prices above $250,000. The monthly increase was more pronounced in condominium and co-op units, which were up 5.3 percent to 600,000. Sales of single-family homes rose 0.9 percent. At the current pace, it would take 4.3 months to sell all homes on the market, compared with 4.4 months in September, below the five-months’ supply mark that realtors consider consistent with a tight market. Existing-home sales account for about 90 percent of the market and are calculated when a contract closes. The remainder of the market is made up by new home sales, which are a timelier indicator as they’re tabulated when contracts get signed. --With assistance from Chris Middleton.